An all-round instrumentalist and staff musician of Bangladesh Betar Khulna, Nikhil Krisna was lucky in the sense that his foundation in music was built at an early age by his father, Sudhir Kumer Majumder. His father was a school teacher as well as a musician. From his father he learnt the basics of the harmonium, dhol, khol and kartal. In post-war 1971, when he was around only 10 years old, his father taught him how to play the 'National Anthem' on the harmonium. His thirst for learning and playing various sorts of music has only increased from then on. His was fascinated by the flute and folk-based music since boyhood, and since then has always been on the lookout for anybody that could teach more about music. Osman Sheikh and Sheikh Samsur Rahman taught him how to play the flute and how to sing folk songs simultaneously. He was so enthusiastic about this, that he used to travel almost 25 km on his bicycle to reach his mentors. It was Sheikh Samsur Rahman who introduced him to the art of live performances, when took him along to various programmes to play the flute. 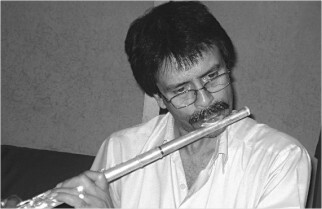 Nikhil was awarded for his flute playing at an exhibition at Khulna Circuit House in 1979. Between 1982 and 1985, he learnt classical flute from Sheikh Ali Ahmed, Chief Music Director of Bangladesh Betar Khulna. On 17 July 1985, he joined Bangladesh Betar Khulna as a part-time musician. Although he specialized in flute, he also played various other instruments like dotora, khol, etc. From 1987, he started learning the Mandolin from Master Apurba Roy and Md. Showkat Hossain. He was recruited as a staff musician of Bangladesh Betar Khulna on in May 1990 based on his outstanding performances. He is still working there and now is considered an expert in playing the flute, mandira, khol, dotora, mandolin, dhol, dhak, etc. Many of his students are working at home and abroad as prominent musicians. He is very proud of the fact that his students are contributing to the development of the music scene of Bangladesh. Nikhil has contributed with his music to films as well, especially films directed by Tanvir Mokammel. Chitra Nadir Pare, Lalsalu, Lalon and Rabeya are some of the famous films where his music was featured. He is an important member, if not the founder, of many cultural organizations in Khulna and in his ancestral home at Fakhirhat in Bagerhat. Every Thursday, he goes to his village home to give free music lessons to a group of music lovers. In the past, he had to go to Kolkata to buy flute and other instruments. But now, he depends on his own talents, expertise and hands in making various kinds of musical instruments. His parents and almost all of his relatives reside in India. But Mr. Nikhil Babu, still a bachelor, is living in Khulna bound by patriotism and by his love for indigenous music and Bangladesh's native songs. This distinguished artiste wishes to live in Khulna for the rest of his life and continue to play his own handmade musical instruments.